Discussion in 'Tunisian Revolution' started by kb21, Feb 6, 2013. One suspected assassin killed and one arrested and rumors of the driver being involved. Lots of problems with demonstrations in major towns and cities and a general strike planned - I think that there must be a curfew sometime soon as lots more trouble anticipated. Not a good atmosphere over here at the moment! marilyna and Galadriel like this. marilyna, tigerlil and wallah like this. DragonZest and wallah like this. Didn't know about that - here there is a 10 day forecast of average temps of 17*c with sun and light winds, but we get it warmer than the north. The sun has been relentless for the last 3 months so I am ok with that. Thanks kb21, but we were here during the revolution, so are used to the chaos of Tunisia in unsettled times I guess. sparkle, marilyna and gem15 like this. It feels like ive been here before! Managed to speak to BF in Tunis about 30 mins ago. Said everything was shutting. Lots of trouble in the Capitol. Tear gas used. Protesters clash with police, blaming Islamist-led government of failing to protect slain politician Shokri Belaid. Tunisia's prime minister has said that he will dissolve the Islamist-led government and form a national unity administration. Hamadi Jebali announced during a speech to the nation on Wednesday he will form a technocrat government. "After the failure of negotiations between parties on a cabinet reshuffle, I decided to form a small technocrat government," said Jebali. He said the ministers would not run for office but elections would subsequently be held as soon as possible. An official source told Reuters earlier on that Jebali's decision, which followed the killing of prominent secular opposition figure Shokri Belaid in front of his home on Wednesday, was a personal one taken in the interests of the country. Belaid, leader of the left-leaning Democratic Patriots party, was killed on Wednesday as he was leaving his home. He was transported to a hospital in the suburbs of Tunis where he died of his wounds, his brother confirmed. 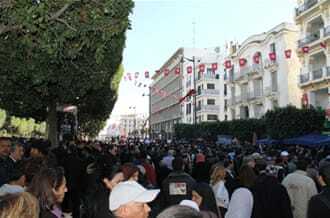 Following news of Belaid's death, violence and protests broke out on the streets of Tunis. Al Jazeera's Ahmed Janabi in Tunis reported violent clashes between Belaid's supporters and police along the main Habib Borguiba Avenue, with the police using tear gas and batons to disperse the protesters and making numerous arrests. Earlier, crowds of mourners, chanting "the people want the fall of the regime", crowded around an ambulance carrying Belaid's body. As the protests intensified, four Tunisian opposition groups, including the Popular Front, of which the Democratic Patriots is a component, announced they were pulling out of the national assembly and called for a general strike. Belaid had been critical of Tunisia's leadership, especially the Islamist party Ennahda that dominates the government. He had accused authorities of not doing enough to stop violence by ultraconservatives who have targeted mausoleums, art exhibits and other things seen as out of keeping with their strict interpretation of Islam. Samir Dilou, a government spokesperson, called Belaid's killing an "odious crime". Moncef Marzouki, the Tunisian president, said he would fight those who opposed the political transition in his country after the death of Belaid. Marzouki, who cut short a visit to France on Wednesday, told legislators at the European Parliament in Strasbourg to applause: "We will continue to fight the enemies of the revolution." Marzouki also cancelled a visit to Egypt scheduled for Thursday after the killing, which brought thousands of protesters onto the streets outside the Interior Ministry. Chanting for the fall of the Ennahda-led government, demonstrators shouted "Shame, shame Shokri died", "Where is the government? ", and "The government should fall". Omar bin Ali, a member of the Tunisian Trade Unions, was present at the demonstration site and said “the Islamists were responsible for Belaid's death". "This is what they have been calling for in mosques," bin Ali told Al Jazeera. Ruling out the possibility of external factors, he said "Tunisia is a friend of all nations. It is hard to think of anyone from abroad to do this to us," adding that "the people want the whole government out as they proved to be useless". The assassination comes as Tunisia is struggling to maintain stability and revive its economy after its longtime dictator was overthrown in an uprising two years ago. Mohamed Jamour, another opposition leader, criticised the government in a press conference on Wednesday for failing to protect Belaid against stated threats. “Threats of plunging into a whirlpool of violence that can be caused by a number of bodies, the state, the revolution guarding committees and armed groups," Jamour said. "Only yesterday, a number of questions were raised ... and Shokri repeatedly emphasised this particular issue. He personally had felt threats to his personal safety. Yesterday I listened on the radio ... a friend of Shokri, in broad daylight, said, "Warn that armed people are going after him." That revolution set off revolts across the Arab world and unleashed new social and religious tensions. Ennahda won 42 percent of seats in the first post-Arab uprising elections in October 2011 and formed a government in coalition with two secular parties, Marzouki's Congress for the Republic and Ettakatol. However, the government has faced many protests over economic hardship. I wouldnt believe a word the PM says, hes a bent as a 5 bob note as is all his family, trust me we've had dealings with them! Midnight sun, DragonZest, annibee and 6 others like this. tunisiasun, DragonZest and BrownGirl like this. The union UGTT declared general strike for tomorrow. marilyna, DragonZest, sparkle and 5 others like this. On a slightly more positive note BF in Tunis said everything was back to normal there today with everyone working & everything running & open today.... No problems... Contrary to the press??!?! Spoke to him for his walk home last night (nothing running & he stayed to speak to me) he said & I heard no problems. hon...yeah sorry hate to say it..gives me no pleasure..but your so spot on..tourism is dead now in Tunisia there biggest income...Ben Ali ...a conman a thief whatever...as most of Tunisia got one thing right tourism he knew where the money was.. but..they have had a year to fill the space..and they have done nothing....they can't expect hand outs from tour operators for another year to keep them going..westerners also have to make a living.. and as u say once islamist have the power they wont leave...maybe that is what Tunisia needs..really I don't know in my opinion a step back..but me i'm a westerner..so what do i know??? very sad..
annibee and Galadriel like this. A little like deja vous here, On Wednesday a popular opposition leader was assassinated and there have been riots in many major cities since. Today is his funeral - also a National strike has been called and there is also of course the all important Friday prayers which is often followed by demonstrations. A dangerous mix which could well escalate into very real problems. It feel very tense and much like it was 2 years ago when we had the revolution!! Not surprising really, as the expected instant paradise after the dictatorship finished, never materialised and there has been simmering dissatisfaction ever since. I hope that I am wrong!! tunisiasun, marilyna, crystal and 1 other person like this. I am of course agreeing with not liking previous two posts. All flights from and to Tunis Carthage have been cancelled today. Chokri Belaid's widow insists on women coming as well to her husbands burrowing today together with her, although the sunni normally don't allow women to assist on the cemetery. tunisiasun, marilyna, DragonZest and 4 others like this. marilyna, DragonZest, crystal and 4 others like this. Some disturbances are occuring outside El Jellaz cemetry. People are breaking into cars and police are firing tear gas. gem15 and BrownGirl like this. I think we should say to all those that are posting on TLR. Stay safe and thankyou for keeping us updated on what's happening there. tunisiasun, marilyna, DragonZest and 2 others like this. And so the looting begins...what are they thinking? A man dies trying to change their live's for the better and they take the opportunity to steal from their own. DragonZest and crystal like this.